A huge and powerful strike of British dockers against low pay, unsafe conditions and casual, precarious employment contracts which, with international solidarity, won nearly all its demands and marked a turning point in UK working class history. The dangerous nature of port work, combined with low pay, poor working conditions and widespread social deprivation ensured that the workforce looked to their trade unions for protection. As a result, industrial relations were strained throughout the history of the port. The first major eruption of unrest came with the Great Dock Strike of 1889. It took place against the background of growing trade unionism among unskilled workers and discontent at the wretched living conditions of dockers and their families. At the root of this was the casual nature of dock labour, organised via the 'call-on' and the contract system. Until the late 19th century, much of the trade of the port was seasonal. Sugar came from the West Indies, timber from the north, tea and spices from the Far East. It was difficult to predict when ships would arrive since bad weather could delay a fleet. The number of ships arriving during a period of four successive weeks in 1861 at the West India Dock was 42, 131, 209 and 85. On some days there were many ships in the docks, on others very few. There was very little mechanisation - the loading and discharging of ships was highly labour-intensive. Demand for men varied from day to day because there was very little advance notice that a ship was arriving. The dock companies only took on labourers when trade picked up and they needed them. Most workers in the docks were casual labourers taken on for the day. Sometimes they would be taken on only for a few hours. Twice a day there was a 'call-on' at each of the docks when labour was hired for short periods. Only the lucky few would be selected, the rest would be sent home without payment. The employers wanted to have a large number of men available for work but they did not want to pay them when there was no work. The dock strike began over a dispute about 'plus' money during the unloading of the Lady Armstrong in the West India Docks. 'Plus' money was a bonus paid for completing work quickly. The East and West India Dock Company had cut their 'plus' rates to attract ships into their own docks rather than others. A trade depression and an oversupply of docks and warehousing led to fierce competition between the rival companies. The cut in payments provided the opportunity for long-held grievances among the workforce to surface. Led by Ben Tillet, the men in the West India Dock struck on 14 August and immediately started persuading other dockers to join them. The Dockers' Union had no funds and needed help. The support they needed came when the Amalgamated Stevedores Union, under Tom McCarthy, joined the strike. Not only did they carry high status in the port but their work was essential to the running of the docks. “Friends and Fellow Workmen. The dock labourers are on strike and asking for an advance in wages ... 6d per hour daytime and 8d per hour overtime. The work is of the most precarious nature, three hours being the average amount per day obtained by the docker. Other workers followed the lead of the stevedores, including the seamen, firemen, lightermen, watermen, ropemakers, fish porters and carmen. 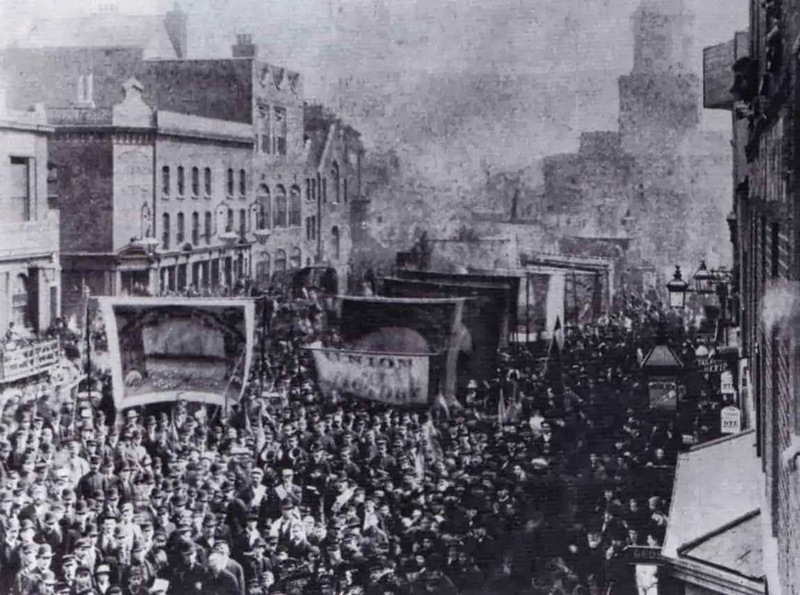 Strikes broke out daily in factories and workshops throughout the East End. The port was paralyzed by what was in effect a general strike. It was estimated that by 27 August 130,000 men were on strike. The dockers formed a strike committee to organize the dispute and decide on its aims. The main strike demand was 'the dockers' tanner' - a wage of 6d an hour (instead of their previous 5d an hour) and an overtime rate of 8d per hour. They also wanted the contract and 'plus' systems to be abolished and 'call-ons' to be reduced to two a day. They also demanded that they be taken on for minimum periods of four hours and that their union be recognized throughout the port. The Strike Committee organised mass meetings and established pickets outside the dock gates. They persuaded men still at work and 'blacklegs' to come out on strike. During the strike, 22-year-old Richard Groves was charged with assault and with threatening two men. His colleague, Alfred Kreamer, aged 49, was charged with intimidating several people. On the whole, however, it was peaceful and the strikers showed remarkable self-restraint. At first food was distributed to dockers and their families. Soon, shilling [5p] food tickets, which were accepted by local tradesmen, were issued instead. However, despite appeals for help, not enough money was coming in to meet the needs of the increasing numbers on strike. As the strike progressed into its second and third weeks, there was great hardship in East London. By the end of August many dockers and their families were starving. “What the cost would be of granting the demands of the men, I cannot exactly say, but it would be at least £100,000 and that would mean we should have to raise our rates. During the strike the port was at a standstill and the dock companies were losing money. Despite this, they believed that giving into the dockers' demands would set a dangerous precedent. In all, over £30,000 was raised by the Australian dockers and their allies. It arrived at just the right time and meant the end of worries about feeding the strikers and their families. The dockers could now face a longer strike and the leaders knew they could now concentrate on the picket lines. Defeat through hunger now seemed very unlikely and the dockers scented victory. On 5 September, when the strike was in its fourth week, the Lord Mayor of London formed the Mansion House Committee. Its aim was to try to bring the two sides together to end the strike. Ben Tillett and John Burns represented the dockers at the negotiations. An important member of the committee was Cardinal Manning (1808-1892), Roman Catholic Archbishop of Westminster. He had shown that his sympathies were with the dockers, many of whom were Catholics. The Mansion House Committee persuaded the employers to meet practically all the dockers' demands. After five weeks the Dock Strike was over. It was agreed that the men would go back to work on 16 September. After the successful strike, the dockers formed a new General Labourers' Union. Tillett was elected General Secretary and Tom Mann became the union's first President. In London alone, nearly 20,000 men joined this new union. The success of the Dockers' Strike was a turning point in the history of trade unionism. Workers throughout the country, particularly the unskilled, gained a new confidence to organise themselves and carry out collective action. From 750,000 in 1888, trade union membership grew to 1.5 million by 1892 and to over 2 million by 1899. “Still more important perhaps, is the fact that labour of the humbler kind has shown its capacity to organise itself; its solidarity; its ability. The labourer has learned that combination can lead him to anything and everything. He has tasted success as the immediate fruit of combination, and he knows that the harvest he has just reaped is not the utmost he can look to gain.